We were soon on our way to Gonarezhou National Park spending our 4 nights there at the spectacular Chilo Gorge Safari Lodge. 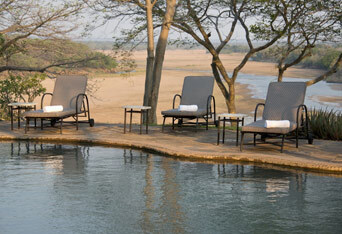 Lying high up on a hill overlooking the Savé River with the park on the opposite bank, this is another of Zimbabwe’s stunning lodges and an old favourite of ours. 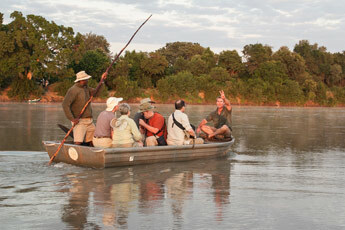 It lies close to the junction of the Savé and Runde rivers which, at 150m, is the lowest point in Zimbabwe. 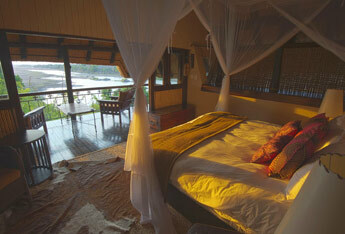 The lodge is beautiful and a truly restful and tranquil spot with the chalets spread out along the high banks. Recent exceptional rains had filled the Savé River and it was not possible to drive across but it was now too shallow for the boat engine so we had to be poled across, no mean feat for the guides. Three safari vehicles were waiting for us on the other bank and soon we were on our way to Tembwehata Pan with its inquisitive hippos and great waterbirds. 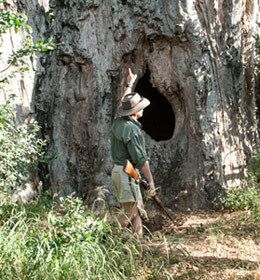 The number of large Baobab trees in the park is equally amazing; one of them with a huge hollow that apparently was a hideaway for a famous poacher in the past. 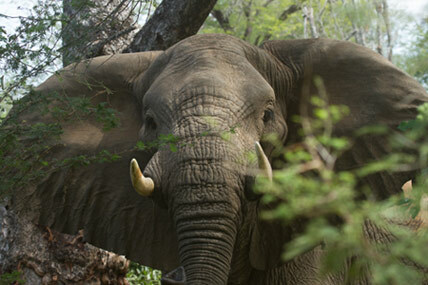 Gonarezhou is renowned for its elephants and they did not let us down - they are also well known for their irascible temperament and there were a few exciting moments during the drives! 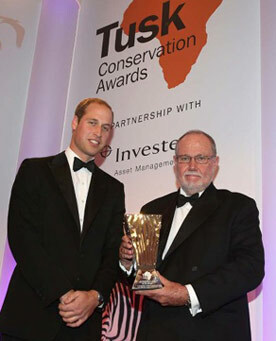 Lodge founder and owner Clive Stockil joined us on our second evening and gave a talk on his inspirational conservation work in the area over the last 25 years and his well-deserved recent Tusk Award. 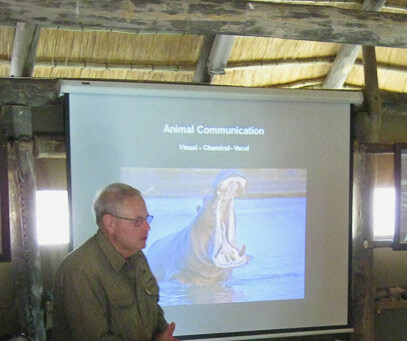 This presentation ended the series of slide shows given through the safari on various wildlife topics - an added dimension to the trip that our group really enjoyed. Our stay included a full day excursion through the park to the spectacular Chilojo Cliffs with a picnic lunch at the base. Unfortunately the Runde River was still too high to cross so we couldn’t drive to the top of the cliffs but there was still plenty to see and do. 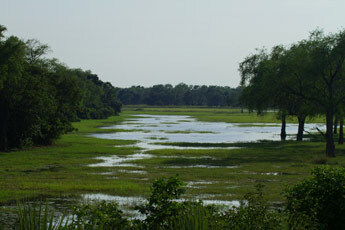 In additional to the mammals there were plenty of amazing flowers, butterflies, bird and frogs. One afternoon was spent in the Mahenye Village with a visit to the clinic (a real eye-opener), a typical Shangaan family homestead, and the school where the group donated footballs, paints and other gifts to the children. Suddenly our stay was almost over and it was time for our final evening's sundowners - it was the perfect setting - on the beach with a small group of elephants on the other side of the river contemplating coming across to join us; followed by a dance group from the village to entertain us as the sun went down. The safari was now at an end - all that remained was the long drive to Harare for our final evening at Casa Kadiki - an excellent guest house in the suburbs. Although all packed up for their onward journeys - either back home, or on to Paris or to the Lower Zambezi National Park in neighboring Zambia, the group managed to squeeze in another shopping stop at the Enterprise Road craft market - as the veteran shoppers amongst us well know - there is always room for a little more! 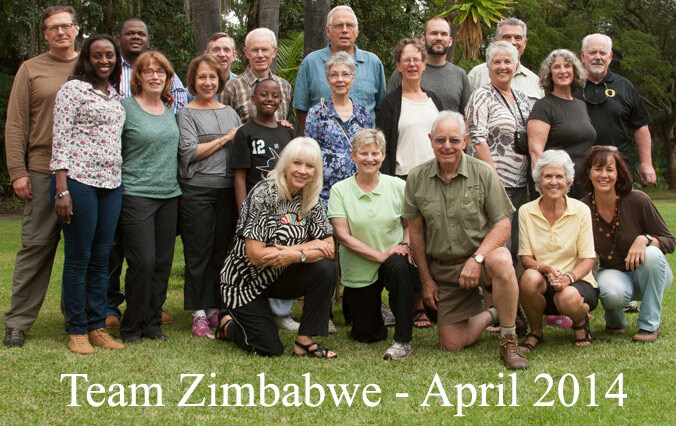 We had a fabulous time and very much enjoyed travelling with our lovely good humoured and enthusiastic group on our journey to Rediscover Zimbabwe!